Most people are looking for a notebook to live through at LEAST one year of heavy use, taking a beating in backpacks, getting coffee spilled on the cover. Lemome provide an alternative to the mainstream with our unique style and simplicity. 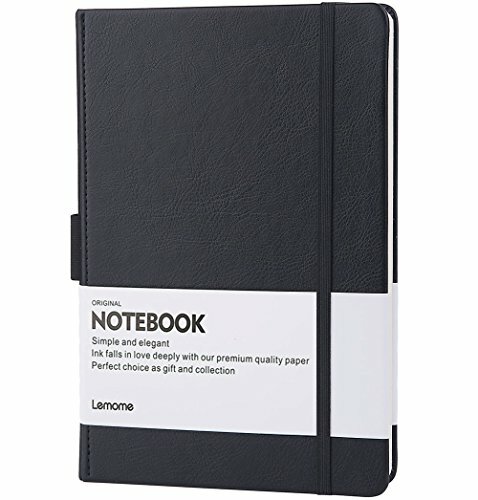 If you are sick of your notebooks not being durable, then this black classic notebook should be your choice. You can carry this notebook with you to capture those scraps of fleeting everyday wisdom, or to jot down notes to help complete the days work, or others can simply use it as a doodle pad. How will your story begin with this notebook? Here are 5 reasons you and the lemome notebook will live happily ever after. 1. Popular Choice - Writing personal thoughts, jotting down ideas, sketchbook, daily planner, learning notes, traveler's notebook, or a blank slate for anything else you can dream up. 2. Convenient Elastic Pen Holder - The elastic pen loop is always available for your pen keeping it secure. 3. Comfortable design - Rounded arc corner which will not cut the hand. 4. 96 Sheets / 192Pages - 120 gsm thick paper means it's perfect to write and draw on, suitable for most pens, but the wettest fountain pen inks. 5. Being hand sewn - The classic notebook is made by manual sewing with high quality thread, no need to worry about the pages falling off. The durable leather covers are easy to wipe and quick to clean. Click on the Add to Cart button to have your new story shipped today. ★ PREMIUM QUALITY & BEAUTIFULLY CRAFTED - Smooth & Elegant black leather cover great for all kinds of occasions. The sturdy design ensures your journal will be well protected and have increased longetivity. Lemome notebooks are unique with no two being quite the same - a special keepsake for your thoughts, plans & ideas. ★ HIGHN QUALITY THICK PAPER - 120gsm, 192pages, which is 30% thicker than normal. The sheets are beautifully soft to write and draw on. Suited to most pen types, but the wettest fountain pen inks. The acid-free paper resists damage from light and Air and the paper protects your eyes from irritation (Original ecological paper, we do not add any chemical additives). ★ PERFECT SIZE & MULTI-USE - A5 Size 8.5" x 5.7", easy for handwriting and carrying in your bag, an Ideal choice for Business or personal use, our daily planners can also be used as bullet journals or diaries. Constructed with an elastic closure, convenient pen loop, inner pocket, bookmark. It also provides an expandable inner and some Page Dividers. ★ GREAT GIFT CHOICE - Thread-bound lay-flat design make your reading more easy and note-taking effortless, enjoy writing by hand with no distractions. Timeless style and simple versatility unite in this popular choice for everyday use. It is a truly unique and makes a wonderful gift in the premium gift box provided. ★ SATISFACTION GUARANTEE - If you don't love it for any quality reason, Just return it and we'll replace it or send you a refund. Customer's satisfaction is our greatest pursuit and high quality is always our goal.